The region’s leaders, and in particular the Broken Hill City Council, have recognised these factors and even before the announcement of the NBN, developed a plan to build a vibrant film industry in the region. 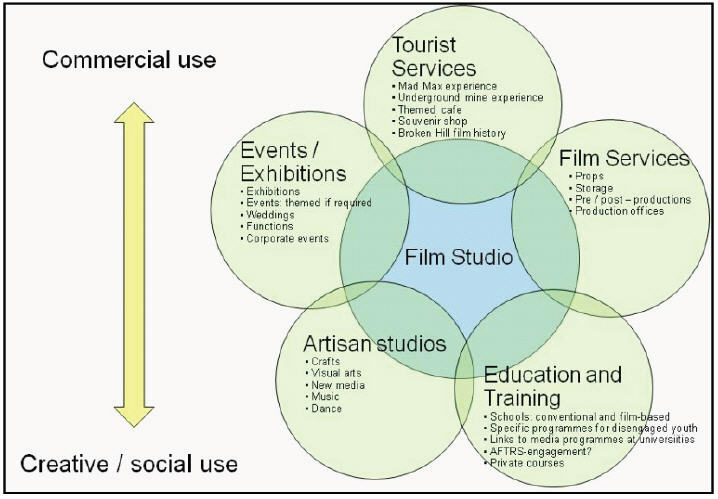 Central to the development of this industry has been the opening of the new Broken Hill Film Studio( see http://www.brokenhill.nsw.gov.au/images/documents/brokenhill/mig/45819-Broken_Hill_Film_Studio_and_Precinct_Business_Plan_Report_Presentation_July_2010.pdf and http://www.brokenhill.nsw.gov.au/images/documents/brokenhill/mig/43338-BrokenHillFilmStudioandPrecinctBusinessPlanSummary.pdf). This major project saw the renovation of the old Central Power Station into a large studio warehouse. The new studio provides a remarkable opportunity for the city to reinvigorate itself and to generate significant revenues as a result. The film studio is forecast to have an economic impact of $23m over 10 years and to support around 30 full time equivalent (FTE) jobs. While the studio can obviously be leased to film production companies, it can also be utilised in a variety of other ways. In developing this strategy we visited the studio and spoke with Film Broken Hill manager Lyndall Roberts about using the NBN to maximise the opportunities for the studio. To have high speed wireless access available to tourists and short-term workers within the whole studio precinct – it is envisaged that many of the visitors will be creative people themselves and if they are provided with internet access will be likely to share their experiences in real time via social media or in near real time via personal blogs, vlogs and websites. To develop a premium tourism experience that only Broken Hill could offer based on its iconic 120 year mining history utilising existing technology, like that developed by the mining school at UNSW – for example, tourists could enjoy a thrilling virtual underground mining experience in the peak tourism season or workers could benefit from excellence in virtual reality mining and emergency safety training at other times.